Our San Francisco Splash Opera Nut is presenting readers with two very different operatic interpretations of the same classic legend. 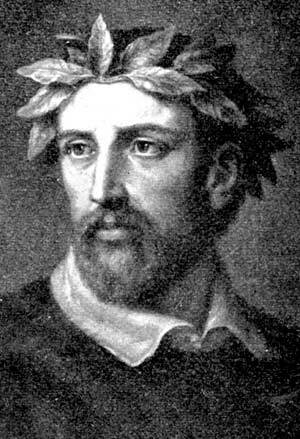 More than 400 years ago the Italian poet Torquato Tasso published his epic poem, La Gerusalemme Liberata (Jerusalem Delivered, 1580), a highly fictionalized account of the last year of the First Crusade. The plot is complex and involves several heroes and heroines, love affairs and triangles, heroic deaths, and magical recoveries. The most popular of the sub-plots appears to have been the relationship between a pagan sorceress, Armida, and a Christian knight, Rinaldo. They are on opposite sides in the First Crusade, but they are also in love with each other. After a stormy affair involving lots of ups and downs, treachery, and magic, Rinaldo leaves Armida to return to the Crusaders and kill a slew of pagans in the final Canto. In the course of that battle (a) he encounters her but ignores her, (b) she starts to kill him but is restrained by her love and decides to commit suicide instead, (c) he stops the suicide, takes pity on her, and promises to restore her to her royal throne and be her champion, and (d) she agrees to become his handmaiden. Jerusalem Delivered has had a great influence on other forms of art. Parts of Spenser’s The Faerie Queen and Milton’s Paradise Lost were inspired by Tasso’s poem. Goethe wrote a play based on the author’s life. A Wikipedia article lists 10 different classical painters from early 17th century through Delacroix in the mid-19th who have imagined and painted scenes from the epic. Due to the lyrical style in which it was written, more than three dozen composers have used Jerusalem Delivered as the basis for a musical composition. Musical forms include madrigals, cantatas, ballets, and operas; composers include Monteverdi, Lully, Vivaldi, Haydn, and Brahms, and the time range is from 1595 to 2005. Of particular interest to me are operas by Handel, Rossini, and Dvorak. I’ve never seen Dvorak’s Armida, but within the past six weeks I have been fortunate to see both of the other two. Let me tell you about them. 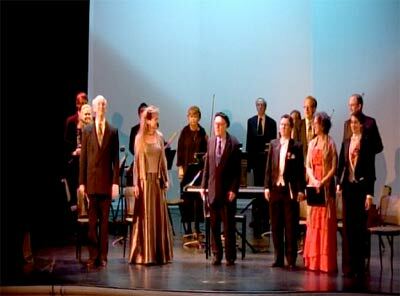 Last month I saw both the Live and Encore Met HD performances of Rossini’s Armida. It was the first time ever that the Met had staged this relatively unknown opera – I hope it won’t be the last. Renee Fleming is fantastic. I accept as a given, that any opera that stars her will be worth seeing. That certainly applied to her role in Der Rosenkavalier which I saw earlier this year, and it applies in spades to Armida which I saw on May 1 and again on May 19. What a combination: Renee Fleming singing Rossini’s music with Lawrence Brownlee. As always, the Met’s special effects are special. The infernal host, led by Keith Miller as Astarotte was terrific. Their ballet in Act II was a high point in the opera. The basic story is a highly personal one with lovely arias and duets. But it is also a story about the conflict between ideals: Love, Revenge, Honor, and Duty. The first two are personified by characters on stage who are visible to the audience, but presumably not to the other characters. Very effective. My first reaction to this concept was favorable, but on reconsideration, it could have been even better. In the first place, why personify only two of the Ideals? Rinaldo’s primary conflict is between Love for Armida and his Duty to his fellow Crusaders. In response to an insult early in Act I he challenges another Crusader to a duel; clearly a conflict between his Honor and his Duty. So much more could have been done with ideals as characters. I also take issue with their concept of Love. I think of Love as a partnership to partake of life together; here it is a withdrawal from life. Armida and Rinaldo are off to an enchanted isle where they are provided with all conceivable luxuries and completely isolated from the rest of the world. Apparently they do nothing all day but tell (whoops! This is opera; not “tell”, “sing to”) each other about how much they are in love. Since this is all done to Rossini’s beautiful music, it’s great for my entertainment, but as part of the story it seems like an awfully shallow love. 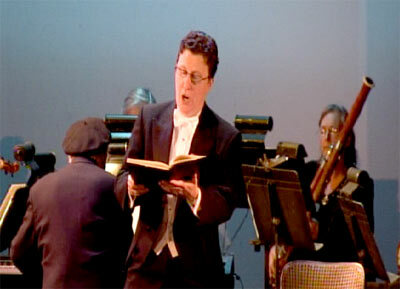 Donald Pippin (center), soloists (front row), and orchestra (rear row) enter stage for Handel’s "Rinaldo"
Although the story is the same, Pocket Opera’s production of Handel’s Rinaldo is unimaginably different from Rossini’s Armida. In fact, Donald Pippin’s productions of any of Handel’s operas are in a class by themselves. I understand that in an authentic production of a Handel opera a soloist would come on stage, strike a pose, and sing a beautiful aria. This would be preceded and/or followed by a lengthy recitatif explaining the latest twist of the complicated plot. 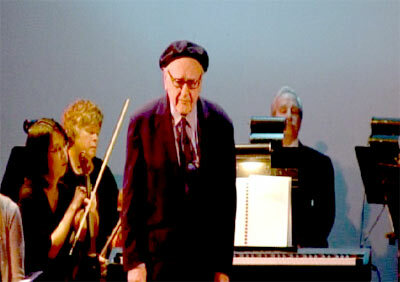 Then another soloist would repeat the sequence and lead the audience through the next plot development. The routine would occasionally be varied by a duet with two soloists. Pippin’s technique is different. It’s called a “concert” version, and indeed all the soloists are seated on stage throughout, only standing to sing their arias or duets with scores in hand. But the interminable recitatifs are replaced by Donald’s inimitable narrations. And rather than sit woodenly when they are not singing, the soloists remain in character throughout, responding to the other singers and to Donald with appropriate facial expressions and body language. Whereas Rossini followed Tasso’s plot line rather closely, Handel changes it right from the start by introducing Almirena, daughter of the Christian general Goffredo. She and Rinaldo are mutually in love, which makes it a whole new ball game. 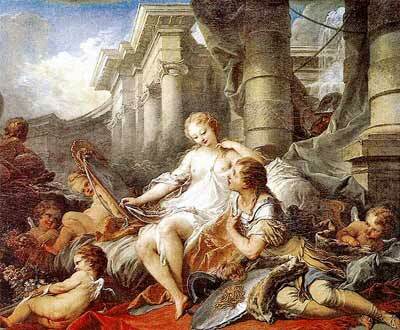 In Armida the battle was within Rinaldo with Duty and Honor on one side and Love (or lust) on the other. 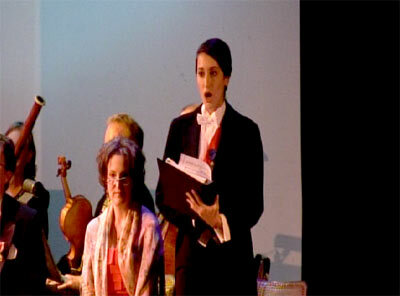 Handel’s Rinaldo has no conflict within himself. The battle is between the two women and he is the prize; his own sympathies are wholly with Almirena. So it’s a different story, but still a good one. Armida kidnaps the two lovers and tries to use her magic but the only thing that works is when she transforms her appearance to look like Almirena. Rinaldo starts eagerly towards her, but the instant he touches her she reverts to herself and he recoils in horror. As always, although this was billed as a concert version there were some wonderful bits of acting going on. While Donald was introducing Rinaldo as a fearless hero and using lots of superlatives, Mezzo Elspeth Franks leaned back in her chair with an extremely smug expression on her face and ostentatiously polished her nails on her lapels. Later, when Donald was describing how powerful Armida was, soprano Marcelle Dronkers didn’t just rise to her feet, she leapt up, raised her right fist high in a menacing gesture, and started her aria with a loud, high, clear note. You didn’t need to know Italian to know that this was a lady to be reckoned with. So, it turns out that my grouping these two reviews together was not as “natural” an idea as I had thought. The stories are almost totally different, the music of Handel and Rossini is totally different, And the production styles of Pocket Opera and the Met are hardly similar. The good news is that I don’t have to compare them; I can just say they are both great. The bad news is that both production runs are finished. If you saw one or both, you are fortunate. If you didn’t, tough! And the good news is that Armida is on the Met’s schedule for 2010-11 and that Pocket Opera will be presenting another one of Handel’s operas. Also, since it was only 6 years since the previous performance of Rinaldo, we can hope that he will do it again in 2016 – I should live so long! This review by Philip G Hodge appeared in sanfranciscosplash.com on June 7, 2010. 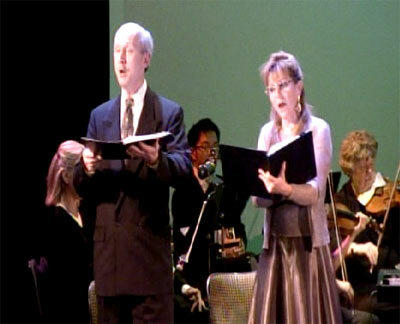 This entry was posted in Opera Review and tagged Armida, Handel, MetHD, Pocket Opera, Rinaldo, Rossini. Bookmark the permalink.